There are a few common mango tree diseases in the United States. The diseases, if left unchecked, can infect not only the homeowner's backyard fruit trees, but those of neighboring yards as well, so quick action is always best. If you're a fan of the luscious tropical mango fruit, the following information will help you identify diseases that may invade your trees. One of the most serious diseases is athracnose. It is caused by the Colletotrichum gleosporioides fungus. Symptoms of this disease include dark leaf spots, blossom blight and fruit rot. The spots that appear on the leaves are small and black or brown. These spots can be small dots or as large as a half-inch in diameter in older trees. The spots may appear much larger in younger trees, and entire branches will have leaves that wither and die. The infection may also appear when the tree is in bloom. The symptoms are brown spots appearing on the flowers, which then turn brown and fall off. Buds are also affected, turning brown, enlarging and then dying off. In regards to the fruit, the fungus infects the skin of the fruit. As it begins to ripen, black spots will appear. The fungus not only causes rotting of the outer skin, but the interior of the fruit as well. This fungus is spread from spores that live in dead leaves on the ground and transferred to the mango through rain or irrigation splashing upon the tree. Once the tree is infected, the spores are transmitted to other branches via water droplets. During lengthy, rainy springs the disease is readily transmitted throughout entire orchards. The treatment is two-pronged. First, it is important to keep the area under the mango tree free of debris and fallen fruit. Second, the trees may be treated with a copper fungicide at several intervals, which include starting at the beginning of the growing period and ending post-harvest. Verticillium wilt is caused by the Verticillium albo-atrum and V. dahlie fungus that lives in the soil. Mango trees that are planted in areas previously used for growing vegetables, such as tomatoes, appear to be most susceptible. The symptoms of a tree infected with this fungus include leaves on one side of the tree wilting, then turning brown and dying. The leaves usually stay attached to the tree, making this disease somewhat easy to identify. To positively identify this disease, a branch is cut from the tree then a longitudinal incision is made. The inside of a tree infected with verticillium wilt will have a brown appearance due to vascular degeneration inside. Keeping mango trees properly pruned, watered, and fed help keep the tree healthy and better able to fight off an infection. Most trees infected with verticillium wilt will eventually die and have to be removed from the landscape. However, you can try to prolong the life of the mango by pruning off the affected areas as soon as you notice the problem. Don't replant back in the same area where verticillium wilt has caused passed problems. Powdery mildew is caused by the Oidium mangiferae fungus and transported through the wind. It appears when there are prolonged periods of cool, dry temperatures. The symptoms of the disease can be identified with the appearance of a white, powdery-like substance on the panicles, new fruit and the undersides of new leaves. 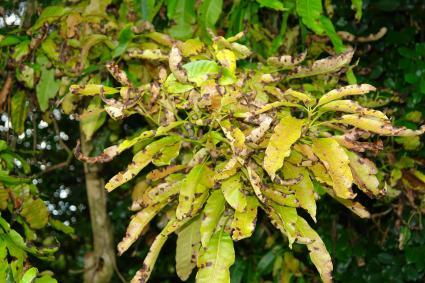 This disease can cause premature leaf and fruit drop and can decimate a crop. Mature leaves that are infected have spots that appear a purplish-brown color. This occurs as the white fungus begins to disappear. The treatment for this fungus is a copper fungicide program that begins in early spring just as the flowers develop and extends to the end of the crop season. 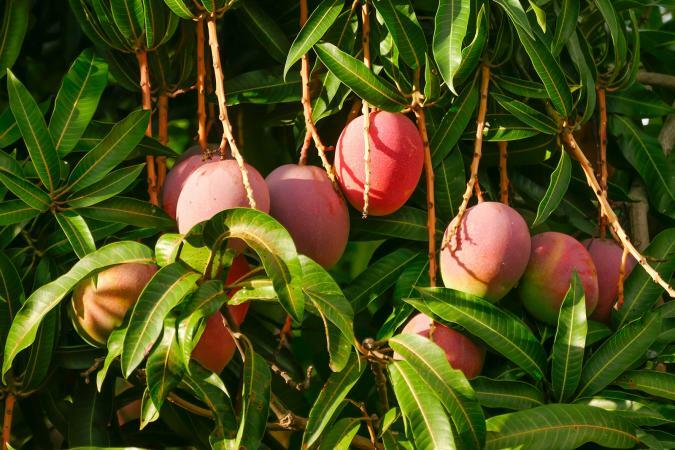 Prevent the problem by planting in the warmest area of your landscape, pruning so the mango has good air circulation, and keeping the area underneath the tree free of plant debris, fallen fruit, and weeds. Red rust, also called algae spot, is caused by a parasitic alga, Cephaleuros spp., and usually doesn't cause any serious problems for the tree other than cosmetic ones. The problem is spread and most severe when conditions are humid, warm, and rainy. 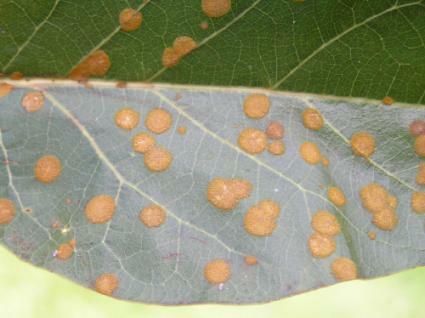 One of the symptoms of this disease is the appearance of dozens of tiny, rust-colored spots on the leaves. If left unchecked, the disease can spread from the leaves to the stems and bark of the tree. Red spore masses will thicken these areas and cause cankers, which will eventually have to be removed by pruning. Prune back into a healthy portion of wood. Always sterilize your pruning blades before and after making cuts so you don't infect healthy sections of the tree. The treatment for this disease is a program of copper fungicides starting in the spring and applied periodically throughout the growing season. Organic foliar fungicides have not been effective in eliminating this disease. Phoma blight (Phoma glomerata) is a soil-borne fungal disease that shows it effects only on older mango leaves. 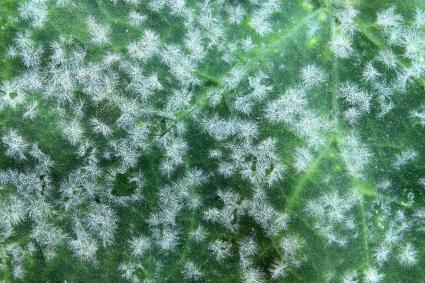 The fungal spores attach to the leaves when water from rain or irrigation hits the infected soil causing it to splash up and upon the tree's foliage. If left untreated and in severe cases, phoma blight leads to total leaf drop and shriveling of the affected branches. 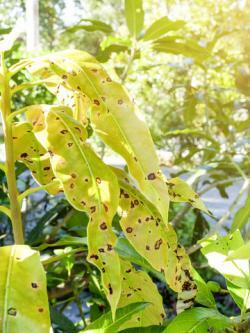 When the fungus first attacks the leaves, symptoms show as small, discolored yellowish and brownish spots eventually covering the entire surface. As the fungal spores continue to develop, the spotting grows in size and area, with the coloration changing to a rusty brown and the centers can take on a grayish color. 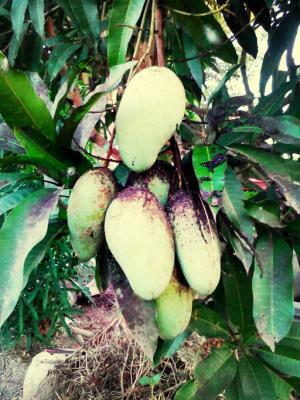 Keeping the mango properly fed and healthy helps prevent phoma blight, as well as keeping the area under the tree clean, removing falling foliage and fruit. When watering, try to keep the wet soil from splashing on the tree. Treat infected trees with a copper fungicide, making sure to cover all surfaces of the tree when spraying. Repeat the treatment every 14 to 20 days. Dieback in mangos can be a serious problem severely affecting the fruit and in severe cases, kill the entire tree. The airborne fungus Lasiodiplodia theobromae infects the tree and causes the foliage, stems, and branches to start browning and dying from the top down. Trees can look almost like they've been burned in a fire. Eventually, the foliage drops from the tree. As the problem progresses, a gummy, yellowish to brown substance oozes from the bark. 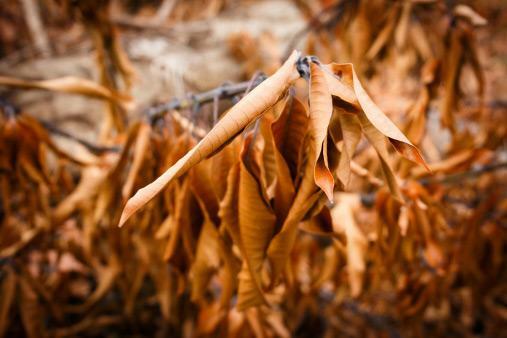 Though dieback occurs throughout the year, it is most common during wet, winter months. At the first sign of the problem, gardeners should prune off all affected branches and stems, making sure to cut back several inches into healthy wood. Make sure you use sterilized pruning tools so you don't transfer disease into healthy wood. To help control and prevent further infection, spray the entire tree as well as the cut ends of branches with a copper fungicide. Bacterial canker, also called bacterial black spot, caused by the bacteria Xanthamonas campestris, can sometimes be a serious disease affecting all portions of the mango, especially the fruit. 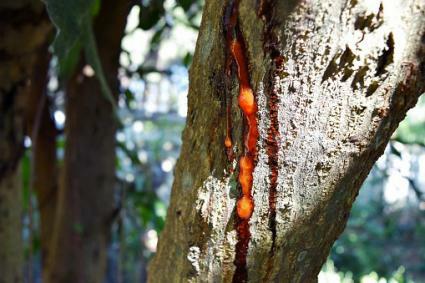 The bacteria enters various parts of the mango through wounds and rapidly spreads to other portions of the tree as they touch each other. The disease is most severe and spreads rapidly during springs where the weather is cool and rainy. Cultivars such as Langra, Totapuri, and Mallika are types more susceptible to infection. First signs of the disease show as dark-colored water spots on the foliage, and over time, the spots grow larger forming cankers. The cankers eventually affect the tree's twigs and immature fruit. Lesions on the fruit turn black and ultimately split open releasing a contagious gummy substance that contains the spores of the bacteria. Early treatment work best and gardeners should prune off affected areas of the tree, making sure to cut back several inches into healthy wood. To keep from transferring the disease to healthy portions of the tree, make sure to sterilize your pruning tool blades before doing any pruning. Once infected, spray all portions of the mango with a copper fungicide and treat every 10 days. Keeping the area under the tree free of weeds and fallen debris helps prevent the problem. Sooty mold is a fungus carried by the wind and attaches itself to all areas of the mango, including the fruit that have sticky honeydew on them. A black, soot-like substance covers the affected areas of the tree and is a sign of an infestation of sap-sucking insects, like aphids, that secret honeydew. In most cases, sooty mold isn't a serious problem and only creates cosmetic problems, so treatment isn't necessary. Treating the insects with an insecticidal soap usually controls the problem from occurring. In severe cases of sooty mold where it covers a large portion of the foliage and twigs, pruning off the affected branches and discarding the trimming in a garbage bag removes the moldy areas from the tree. You can also use a mild dishwashing soap mixed in water and wash the mold from the leaves. 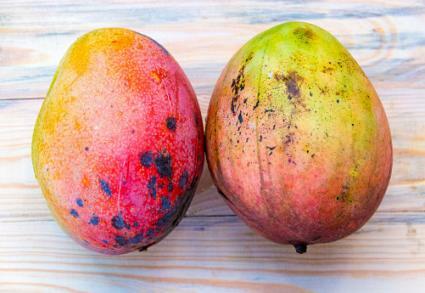 Mango malformation isn't a very common problem in the U.S., but gardeners should be on the lookout for signs of the disease as the tree starts blooming. The fungus Fusarium mangiferae is the source of the problem and affects the developing flower panicles. Scientists are still studying the disease and it's thought to be spread by windy conditions. The disease is also spread long distances through vegetative propagation materials (grafts), contaminated pruning tools, and mango bud mites. The panicles develop with a short, stubby, and clustered appearance with the fruit never developing. Flowers eventually dry up, turn black and die. Gardeners should prune off affected panicles and shoots as soon as they notice the problem and discard in a garbage bag so the fungus doesn't affect healthy portions of the plant. Make sure to sterilize your pruning tool blades before doing any trimming. If insects become a problem, spraying the tree with an insecticidal soap should control the problem. Periodically spraying the entire tree with a copper fungicide helps prevent the problem. Manage most mango tree diseases by cleaning up fallen fruit, dead leaves, and branches at the end of the growing season and by periodic applications of fungicides. However, it's impossible to eliminate all diseases because some fungi may remain dormant in the soil for several years or spread by neighboring stands of trees. At the first sign of infection, begin a regimen of fungicide applications. If there are no signs of improvement, contact your local Cooperative Extension office or the nursery where you purchased your trees for a correct diagnosis of the disease.